Over the years, so many people has recommended Maedaya to me, both in the blogsphere as well as my regular friends, because Richmond is filled with so many great restaurants, it took me a while to finally pay Maedaya a visit for dinner with a friend before she embarks on a two-months volunteering trip to Cambodia and Laos. 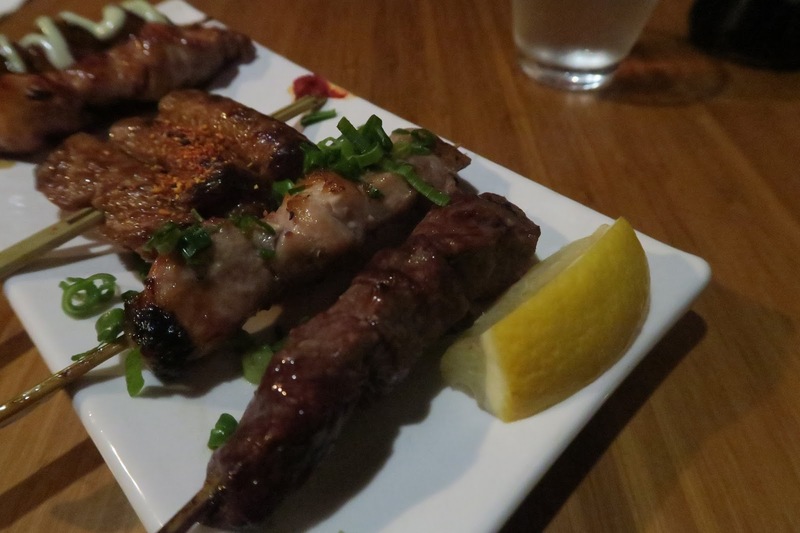 One of the main feature that sets Maedaya apart from other Japanese restaurants in Melbourne is their large selection of grilled skewers! 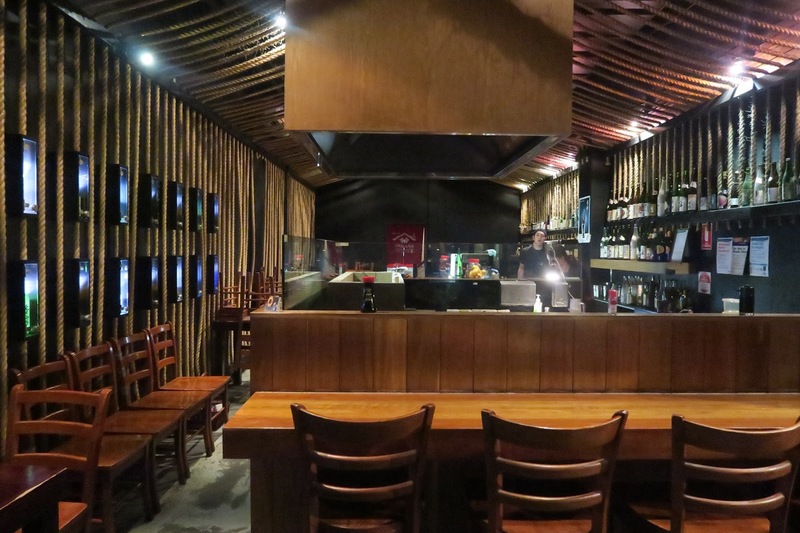 The skewers are being freshly grilled by the chef in the middle of the restaurant, and the smoky aroma hints at a good time ahead. 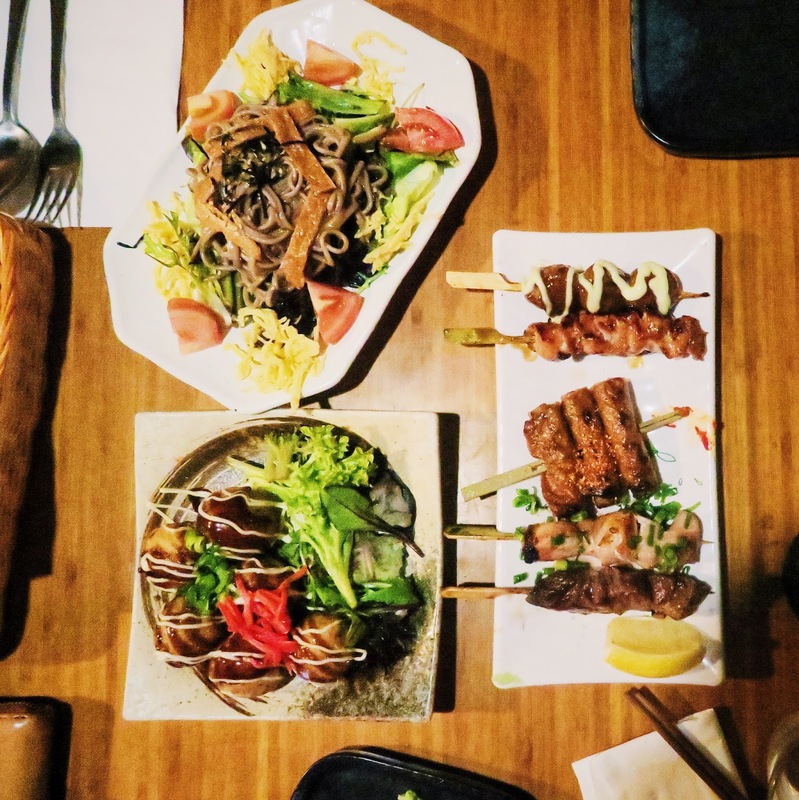 Because there are a myriad of choices and it was our first time, we decided to get two platters to try out a bit of everything. 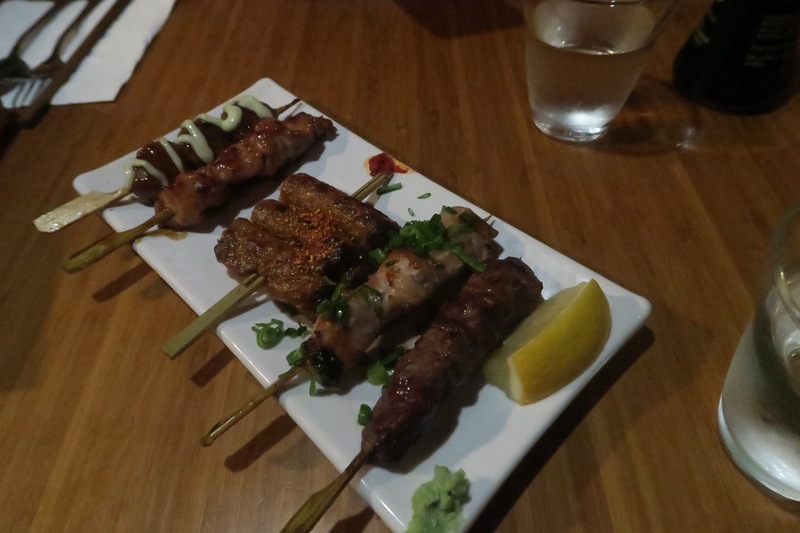 The Maedaya Sumiyaki Set came with chicken balls with mayo, two types of yakitori, inari kushi, and a beef skewer. 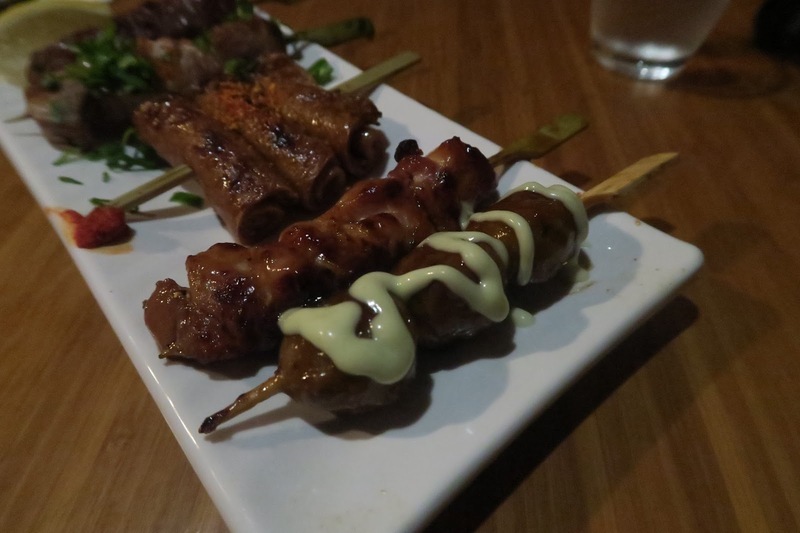 The chicken ball was juicy and tender, and the yakitori’s glazing made it so morish to eat. I thought this was sliced pork at the start, but it turned out to be beancurd sheets which have been rolled and grilled, with a sprinkle of chilli over the top. 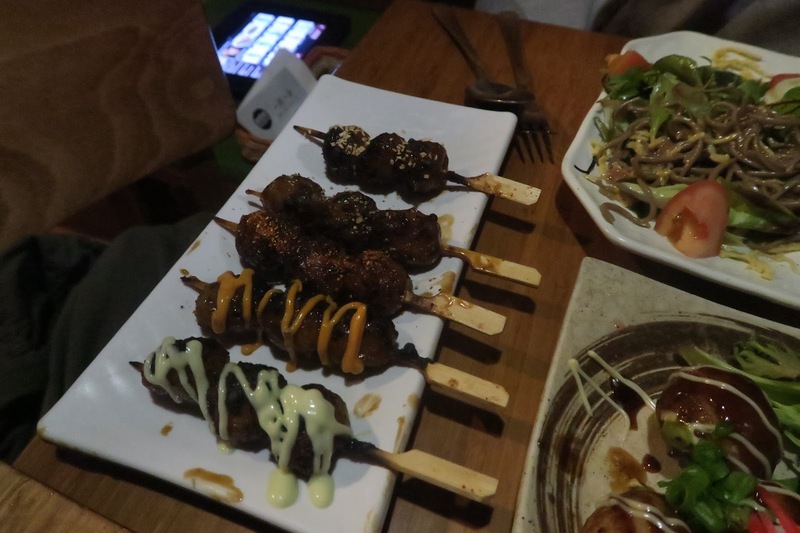 The yakitori was topped with spring onions rather than the glazing, which meant you could enjoy the simple flavour of the chicken. 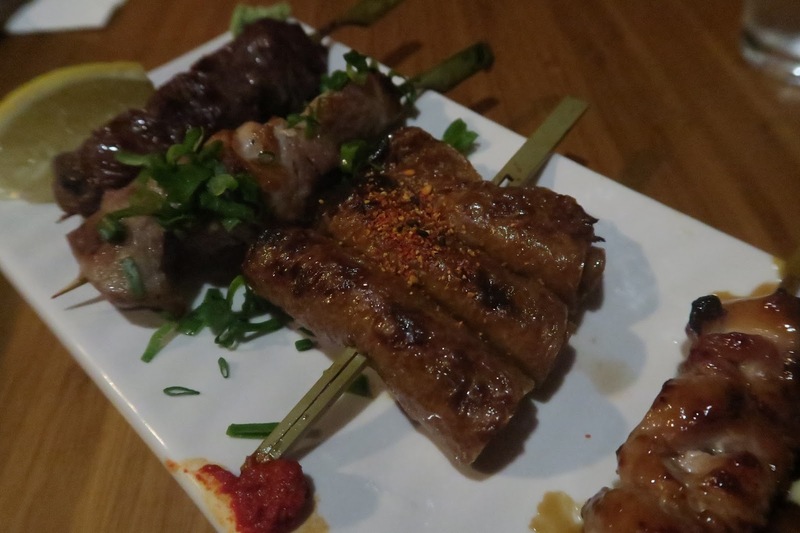 The beef skewer was also seasoned simply with some salt and pepper, and had a bit more bite to it, with a ton of beefy flavour coming through. 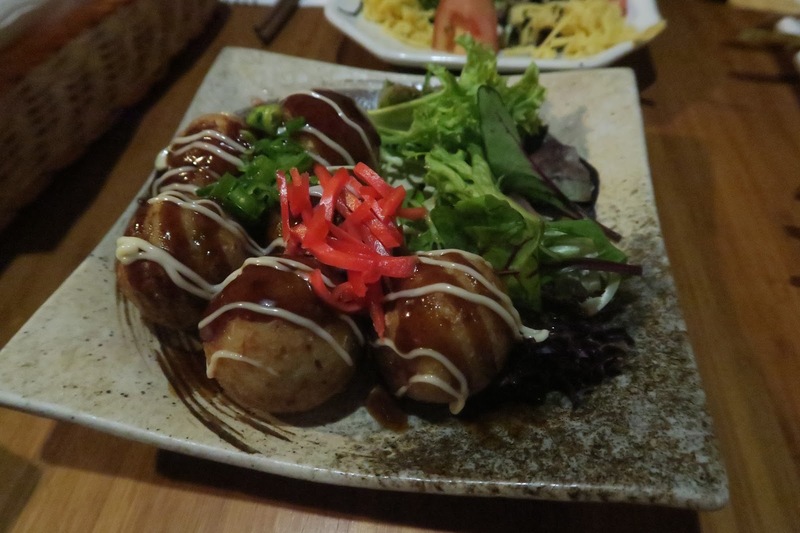 The chicken ball set was flavoured with a range of sauces and spices, including wasabi mayo, spicy mayo, chilli flakes, pepper, and garlic. My favourites were the spicy mayo and pepper, and my friend can’t eat spicy food, which meant her favourite was the garlic. 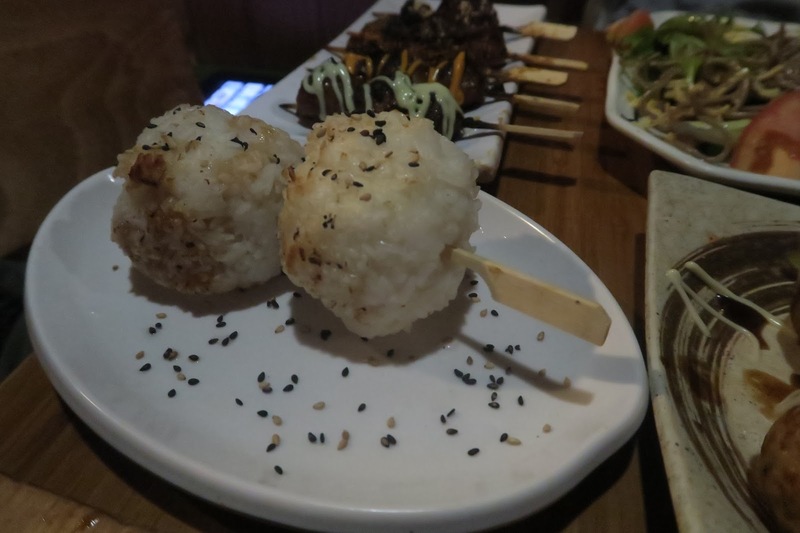 Originally we ordered the rice balls because they just looked so funny, however, it actually turned out to be the perfect accompaniment for all those skewers! 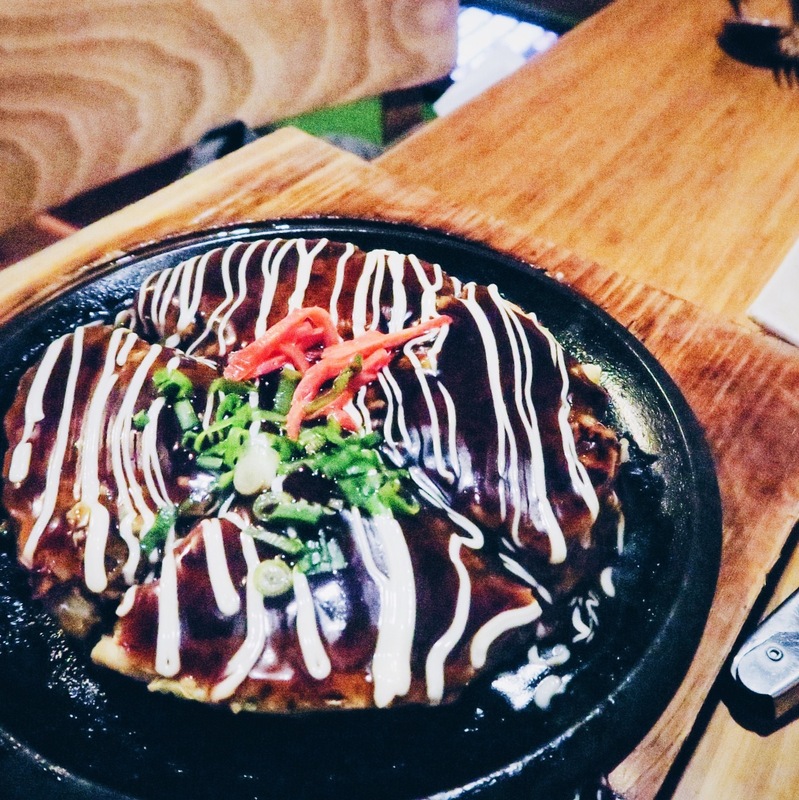 The okonomiyaki looked amazing when it was put on the table, the glazing was so shiny and the kewpie laid so perfectly over the top. There was a good amount of cabbage in there, which meant there was plenty of bite to the pancake, however, it was still a lot softer than what I’m used to, maybe because of the thickness? The glaze didn’t just looking pretty, it was just the right amount for the okonomiyaki too. The takoyaki were a bit cold, possibly because of how long I took to take some photos haha. They had plenty of octopus pieces though, but I wish they were just a tad more crispy. 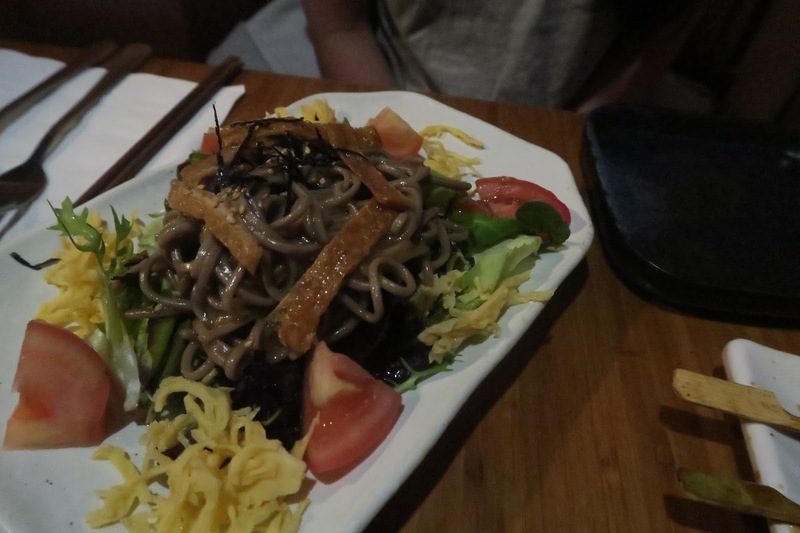 We also ordered a soba noodle salad for something more substantial, and to add some vegetables into the mix because #health. The dressing was definitely the highlight of this salad, it was tangy and sweet, providing a lighter end to our meal. Despite desperately wanting to out some of the desserts, we made the mistake of over ordering, and was so full by this point, surprisingly the bill was just under $60, which is pretty cheap considering how much we ordered, we could’ve easily forgone one or two dishes. 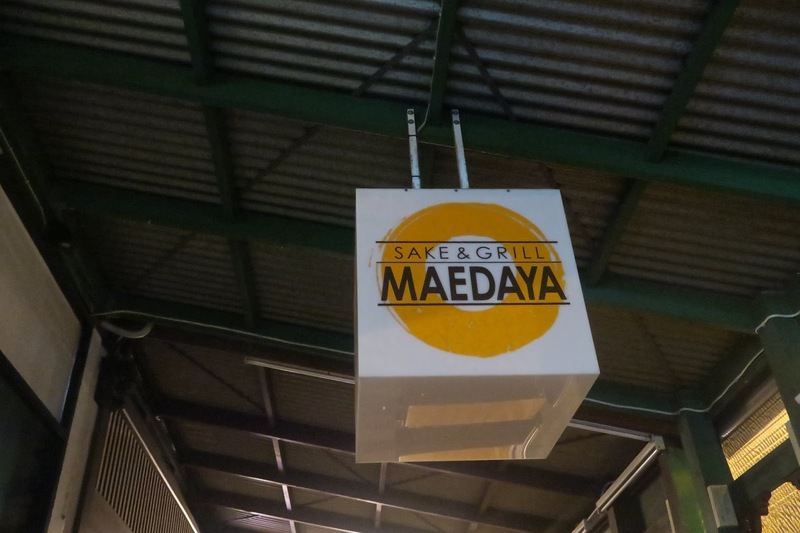 I can definitely see the appeal of Maedaya, and why there was a twenty minutes wait even on a Tuesday night, and I’ve already marked it down for a place to revisit since there is so much more on the menu I’d love to try! 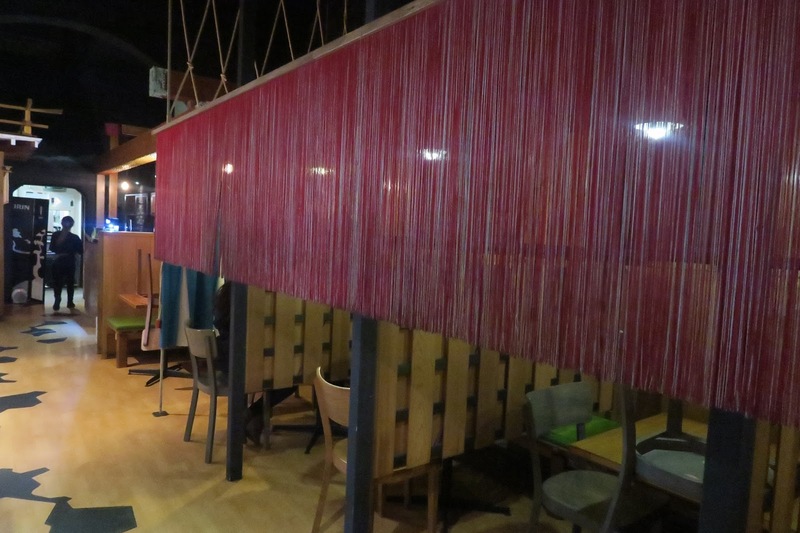 Maedaya is located on Bridge Road, catch tram #48 towards North Balwyn from Parliament, and get off at stop #20, Coppin Street/Bridge Road, the restaurant is less than 100 metres away.